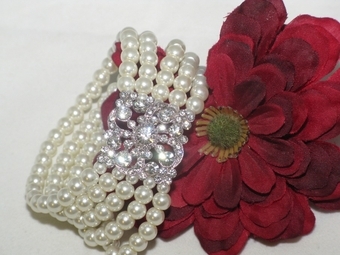 Carolina - GRACEFUL ivory pearl bridal bracelet - SALE!! HOME / BRIDAL JEWELRY / Wedding Bracelets / Carolina - GRACEFUL ivory pearl bridal bracelet - SALE!! Five rows stretch bracelet of elegant ivory pearls with encrusted dazzling rhinestone center. Gift box or pouch included.